The perfect addition to our 64mm, 76mm and 92mm Supreme Systems, the Cavity Door Slider has now matured into our flagship sliding solution. With an abundant of units sold into a wide range of indoor applications, we’ve yet to receive anything but positive feedback. Now with optional “clip-on” Pelmet! Now accommodates new System Adaptors! Coming in a standard 1m wide carcass, the Cavity Door Slider is also available in custom sizing to accommodate up to 1500mm wide doors. The Cavity Slider offers modern, minimalist design matched with quality Hafele easy-glide rollers, self locking stop and latching mechanisms and all-new high quality European soft closer. Along with the European quality, the rollers are easily removable for simple servicing. 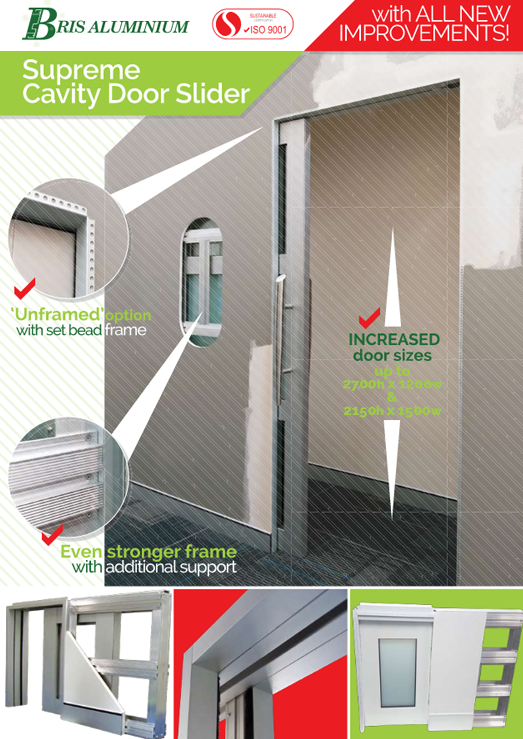 Bris Aluminium has created a door which is stylishly functional. 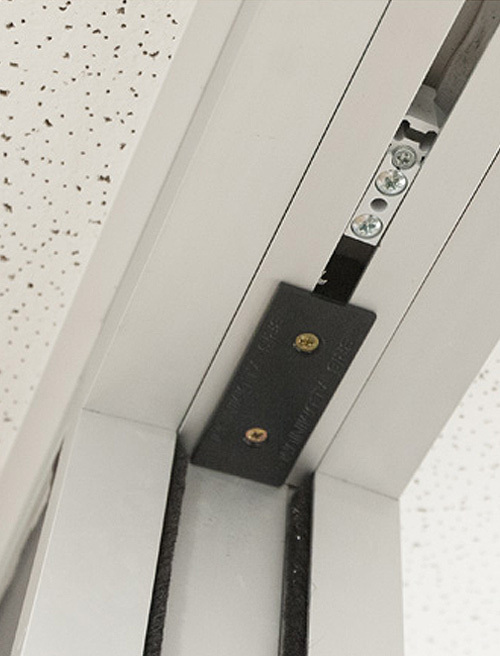 With no pelmet and a receiving track, which leaves no gaps along the side of the closed door, the clean lines of the door will suit any modern office perfectly. You can now get an even more minimalist look to the install due to the new set bead frame. This removes the aluminium trim around the door opening providing you with a flush finish with the wall. Please click on the photos above to go to the architecture DWG drawings and components for each product suite. It also has the added advantage of being supplied in a simple to install kit form. Its purpose-made packaging makes it easy to transport and protects it from damage. 70mm timber stud with 10mm plasterboard – great for residential builds! Accommodates new System Adaptors allowing a reduction of13mm board to 6.5mm to accommodate 6mm Villaboard; or 13mm down to 10mm to accommodate 10mm plasterboard (or 9mm Villaboard) on one or both sides.